There are over 26,000 varieties of orchid known in the world. It is one of the most diverse plant groups with representatives in almost every corner of the world. Isotria whorled pogonias are one of the many unique varieties. What is a whorled pogonia? It is a common or threatened species that you are not likely to find for sale, but if you happen to be in a forested area, you might run across one of these rare native orchids. 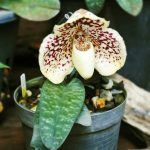 Read this article for some fascinating whorled pogonia information including its range, appearance and interesting life cycle. Isotria whorled pogonias come in two forms: the large whorled pogonia and the small whorled pogonia. The small whorled pogonia is considered rare, while the larger form of the plant is quite common. 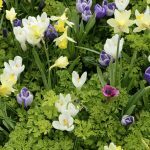 These woodland flowers thrive in shade, partial shade or even fully shaded areas. They produce unique flowers that are not so much showy as just plain unusual. One strange bit of whorled pogonia information is its ability to self-pollinate. Isotria verticillatais is the larger of the species. 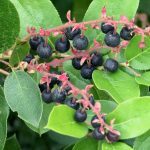 It has a purplish stem and five whorled leaves. Leaves are green except for the underside which may be bluish-grey. Most plants produce 1 or 2 flowers with three yellowish-green petals and purple-brown sepals. Blooms are about ¾ inch long and eventually produce an elliptical fruit with thousands of tiny seeds. While not a brilliant color combination like many classic orchids, its very strangeness is alluring. Plants in the group Isotria medeoloides, the small whorled pogonia, are only about 10 inches in height and have greener flowers with lime green sepals. Bloom time for both is between May and June. Where Does Whorled Pogonia Grow? Both species of whorled pogonia plants are native to North America. The larger pogonia is common and can be found from Texas to Maine and into Ontario in Canada. It is a wet or dry woodland plant that may also appear in boggy regions. 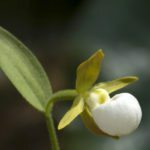 The rare small whorled pogonia is found in Maine, west to Michigan, Illinois and Missouri and south to Georgia. It also occurs in Ontario. It is one of the rarest species of orchid in North America, primarily due to habitat destruction and illegal plant collection. It requires a very specific terrain where water moves down to its location. Rerouting waterways has destroyed entire precious populations of this unique orchid. Whorled pogonia plants grow in soil called frangipan, which is the thin, cement-like layer under the surface of the soil. In previously logged areas, the orchids grow at the bottom of slopes in this frangipan. They prefer granite soils and acid pH. The orchids may grow in hardwood stands of beech, maple, oak, birch or hickory. Soils must be moist and humus rich with a thick layer of composting leaves. While the large whorled pogonia is not listed as rare, it is also threatened due to habitat loss and expansion. Both are also in danger from recreational activities, such as hiking, which trample the tender plants. Collection of either species is forbidden by law.